Looking ahead to the 72nd anniversary, the peak attention the veterans enjoyed at the 70th anniversary in June 2014 seemed a distant memory. As planning progressed, it seemed our 2016 pilgrimage would be an enjoyable, but more relaxed affair. However, some special inclusions were slowly gathering. During the Spring of 2016 we were sad to lose a number of veterans we had come to call friends. Our own committee member John Shanahan died quite suddenly after a short illness. This was quickly followed by Jim Baker DSM of the Royal Marine Commandos and Lance Rooke of 9th Parachute Battalion. It is of course nature’s way given our Normandy veterans are almost all in their nineties. 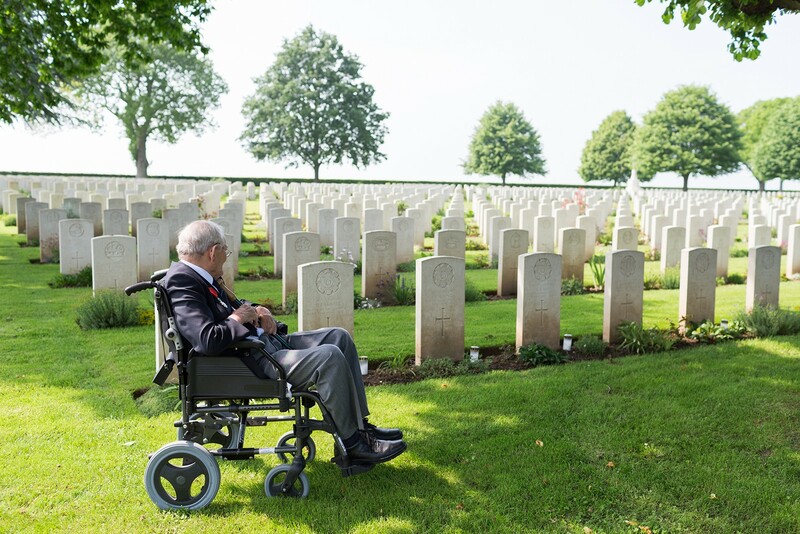 Nevertheless it is always distressing to say goodbye to those who have been part of the “D-Day Revisited family” for some years and we certainly missed them in France. 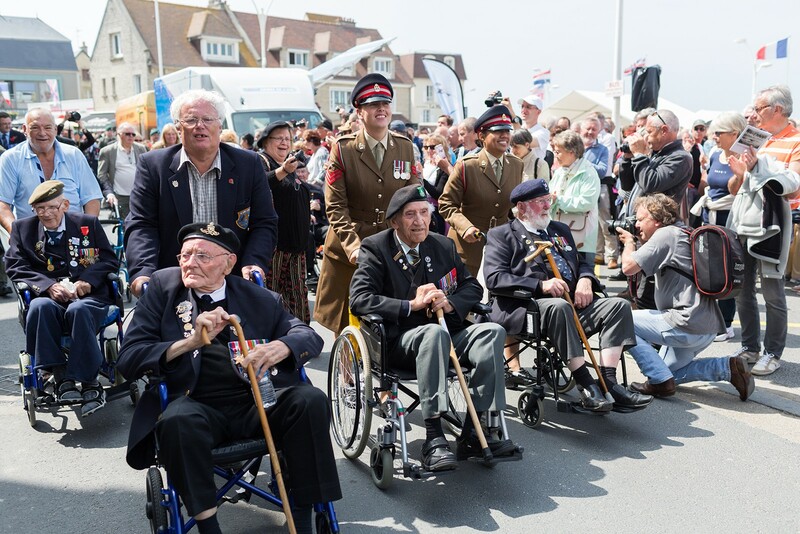 One of the pleasures that comes with our management of LIBOR funding on behalf of HM Treasury is that it provides us with increased opportunity to make the aquaintance of many more Normandy veterans, who we also hope will become firm friends! The 73rdAnniversary began on Thursday 2ndJune 2016. 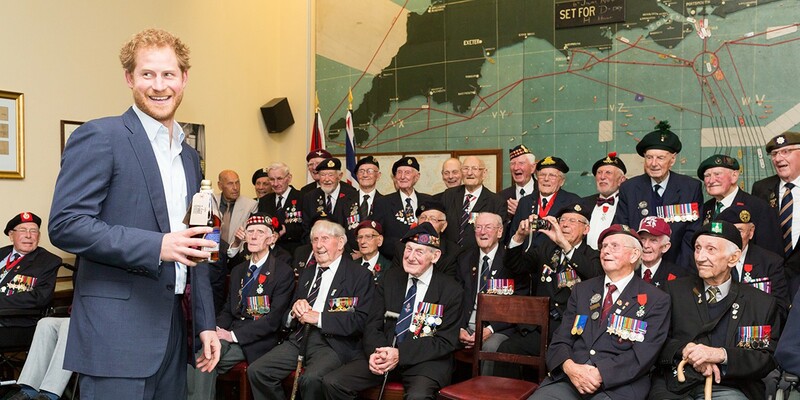 The final group consisted of 45 Normandy veterans, 41 wives/companions and 19 helpers. This year we had a change of policy, saying goodbye to the St. John’s Ambulance support and replacing this with a group of five serving military medics from the Queen Alexandra Royal Army Nursing Corps (QARANC). In consultation with Cliff Ennis at SJA, it was agreed to step up to a formal military presence in acknowledgment of advancing age of those traveling. 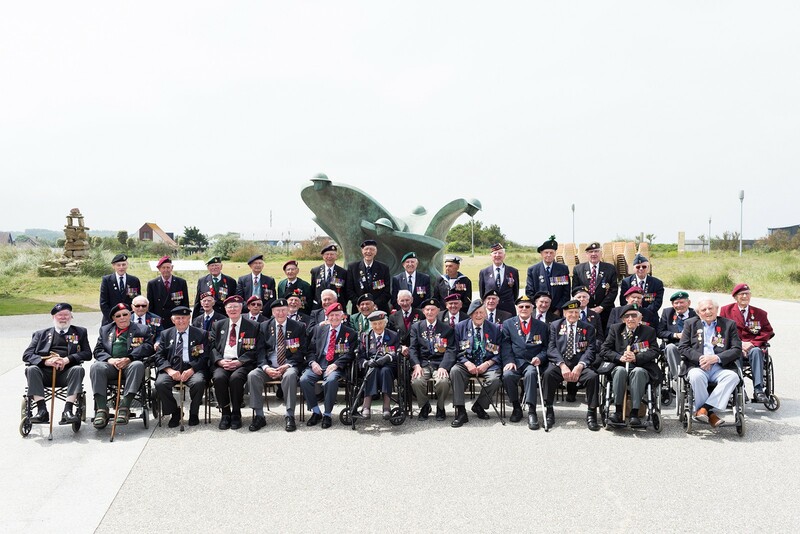 As a special arrangement we hired an invalid vehicle so that Pegasus Bridge Para veteran, Ivor Anderson, could make the journey to Normandy for the first time since 2013. Happily one of the QARANC medics, Cpl. Kirk Blakemore, kindly agreed to be his “chauffeur”. We welcomed two new pipers: Robyn Smith and Craig Wright. 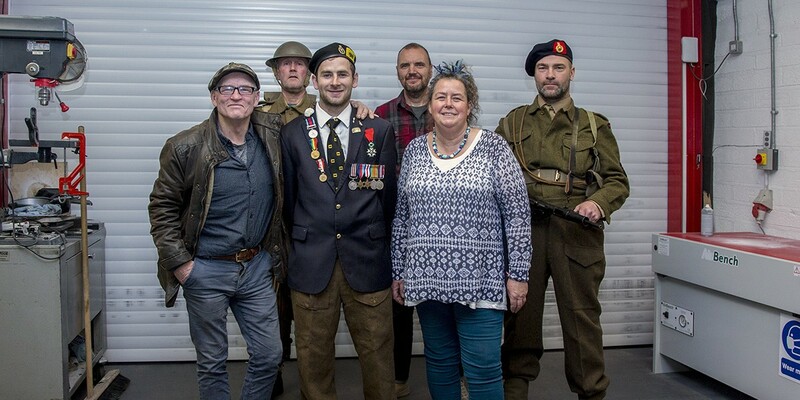 The veterans were very pleased to see Michelle Gillespie and Eamonn Cowan who joined us again as additional helpers, as well as Kate Rousseau who has also become a firm favourite – always willing to lend a hand and act as our official interpreter on our adventures up and down Normandy! The journey began early on Thursday 2nd June at St. George’s Hall in Liverpool and Ellesmere Port. It was an early start as we were booked to be at Southwick House in Portsmouth by 4.30pm for our eve of departure ceremonial dinner. There was particular anxiety amongst the coach leaders as they held the secret of a VIP guest. The road journey progressed reasonably well with pick-ups en route, stopping at Knutsford, Stoke, Warwick and Oxford, where we hit a traffic blockage. With some smart re-routing by our marvellous driver, Lee Carver, the group finally arrived at the Queen’s Hotel in Southsea at about 4:15pm. There we were enthusiastically greeted by other members of the group who had made their way to Portsmouth independently. After a rapid check-in and change of outfit, the two coaches left for Southwick House. Already at least half an hour late, the coach leaders explained to everyone that HRH Prince Harry would be joining us for a pre-dinner visit! This announcement injected some energy and brought a smile to many faces. When asked whether anyone had any questions, the ever beautiful QA veteran Vera Hay replied without hesitation, “Yes, do I look alright?!“. Upon arrival, everyone was escorted into the main house and settled down with pre-dinner drinks… some with teas and coffees, others opting for a tipple of something stronger! Our Royal guest duly arrived and was met by the Lord Lieutenant, Nigel Atkinson. On entering through the front portico, HRH was welcomed by Southwick Park’s Commanding Officer Wing Commander Martin Bland, Ft. Lt. Rupert Moore, D-Day Revisited Chairman John Phipps and his daughter Victoria. 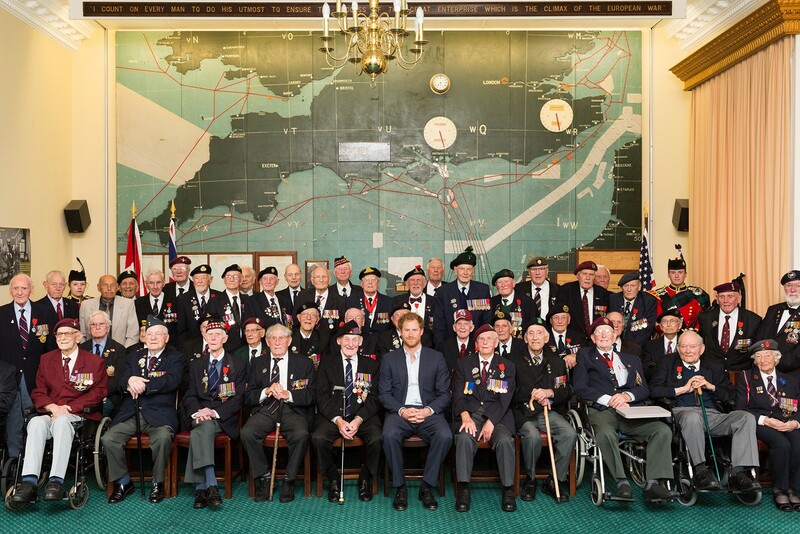 Jeremy Green OBE, the Southwick House historian, then led Prince Harry into the famous Map Room and introduced Normandy veterans John Dennett and Frank Diffell, both Landing Craft men. 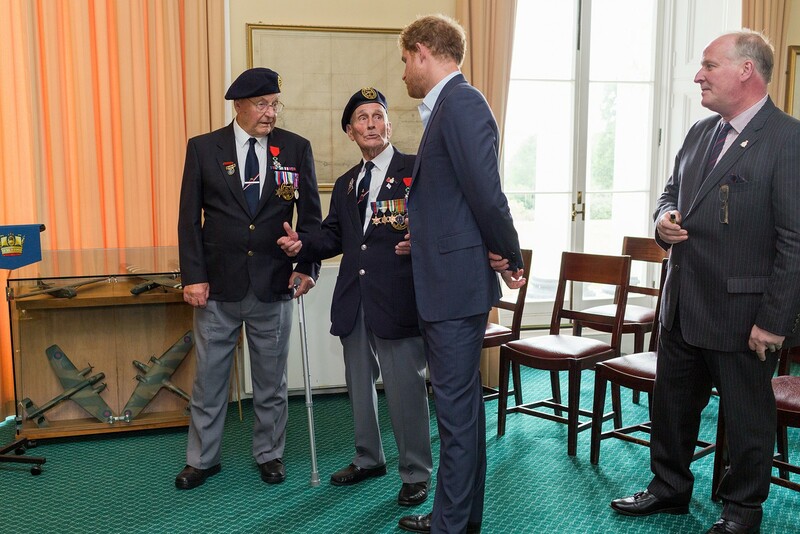 John and Frank then spent some time explaining the maps depiction of the D-Day Invasion with Prince Harry, who was keen to learn about their own personal experiences of that day. After signing the Visitors Book, Victoria led HRH into the Ramsay Room where he was careful to spend time chatting with each of the veterans in the group. This tour continued through the Eisenhower Bar and into the Cambridge Room. Everyone had a wonderful time and it was clear Prince Harry enjoyed himself too. As a military man he spoke in the same language; listening to first hand experiences of D-Day and the Normandy Campaign. 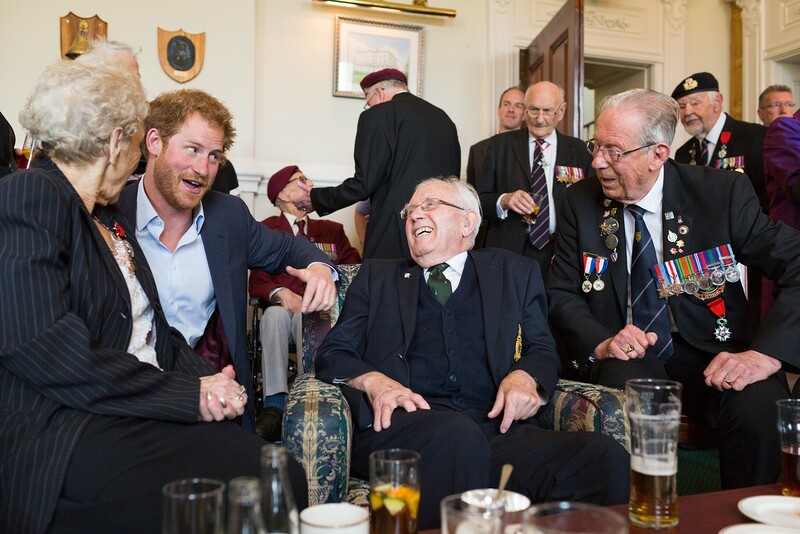 Sometimes the conversation was appropriately serious, but mostly it was clear the Prince relished the opportunity to exchange good-natured banter with the veterans. After about an hour and a half everyone was brought together in front of the D-Day Map for a group photograph. This was subsequently presented to HRH Prince Harry in a frame which included signatures of all those veterans present. After our Royal guest’s departure everyone was piped into the Mess Hall for dinner. 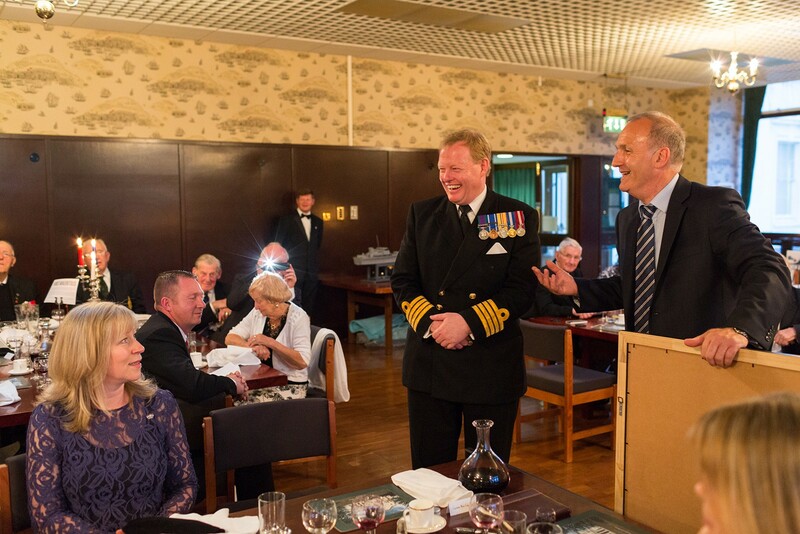 Our guests included Neil Rankin CB CBE and Peter Goodship of the Portsmouth Naval Base Property Trust (PNBPT), Jeremy Green OBE and Captain Rex Cox with his wife, Fergie. We were also pleased to welcome Guy Huntrods CBE, a Normandy veteran of the Royal Navy who was unable to travel to Normandy, but graciously joined us for the evening at Southwick House. Victoria & Beryl had prepared table decorations which were very much Royal Navy themed this year; each table represented by a ship which took part in Operation Neptune. In deference to the PNBPT, this naturally included MGB-81! After dinner John Phipps took the opportunity to present a few gifts. Due thanks were expressed to Neil Rankin and Peter Goodship for their continued support and particularly for the introduction of MASB 27: our ongoing restoration project. 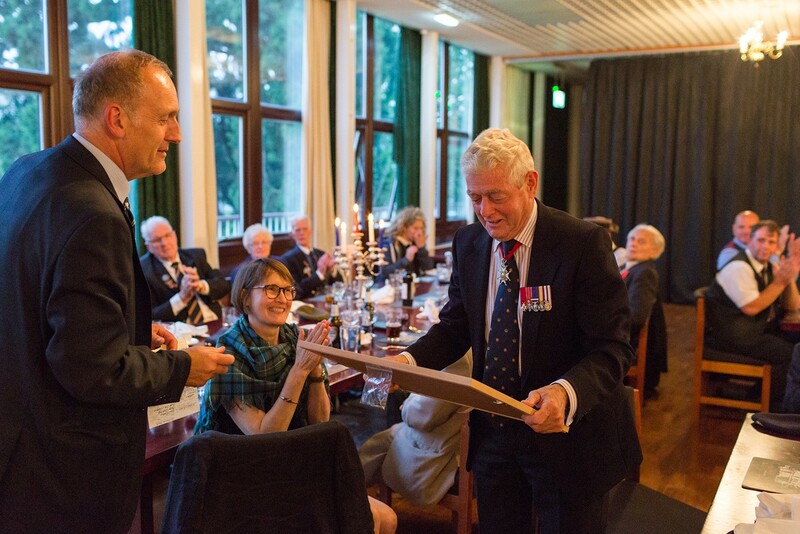 John presented them with a framed photograph of MASB 27 in wartime appearance, signed by Royal Navy veterans. Captain Cox made a brief speech in thanks and expressed with feeling how much he and his wife had enjoyed the evening in such splendid company. It is fair to comment that his main point was recognising the value of seeing first hand what is being achieved through spirited and directed funding, something which cannot be seen from an office desk. The whole dinner experience was delightful as usual. Our highest gratitude goes to Mark Pennington and all his staff, especially Head Chef Andrew Kitchen. 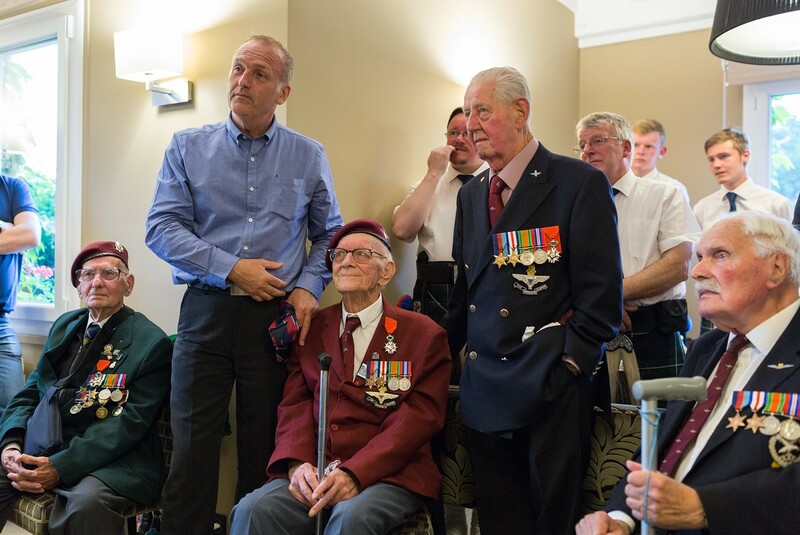 The Normandy veterans are always given very special treatment at Southwick House and it seems that our expressed thank you is inadequate for the effort made by everyone. The following morning both coaches took the short journey from the Queen’s Hotel to Portsmouth Historic Dockyard. Veterans were graciously invited to visit HMS Victory, the Mary Rose and the other exhibitions. This year some opted for a harbour boat tour which took them around the military installations and moorings. 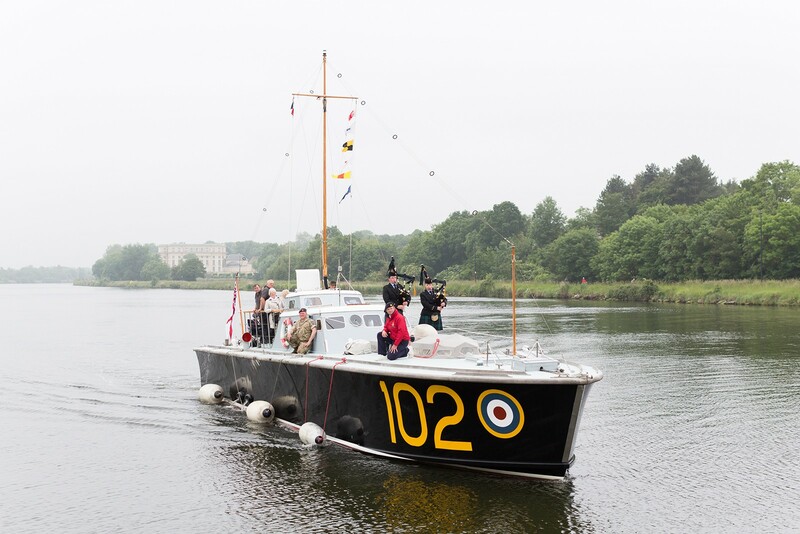 The veterans were pleased to note the restoration activities in Boat House 6, operated by the National Museum of the Royal Navy. A lunch was provided in Boathouse 7 by the Portsmouth Naval Base Property Trust (PNBPT), arranged by Neil Rankin and Peter Goodship. Veterans were welcomed by the Lord Mayor of Portsmouth and a speech was given by the Former 1st Sea Lord, Admiral Sir Jonathan Band GCB DL. We were sorry to leave, but on we went to check-in for the Brittany Ferries service to Ouistreham. All boarded for the 2:15pm departure and enjoyed a relaxed crossing in fine weather. On board we met John & Dorrie Millin who kindly introduced us to the Hon. Henry Montgomery, who is of course the grandson of the Field Marshall: Viscount Montgomery of Alamein. 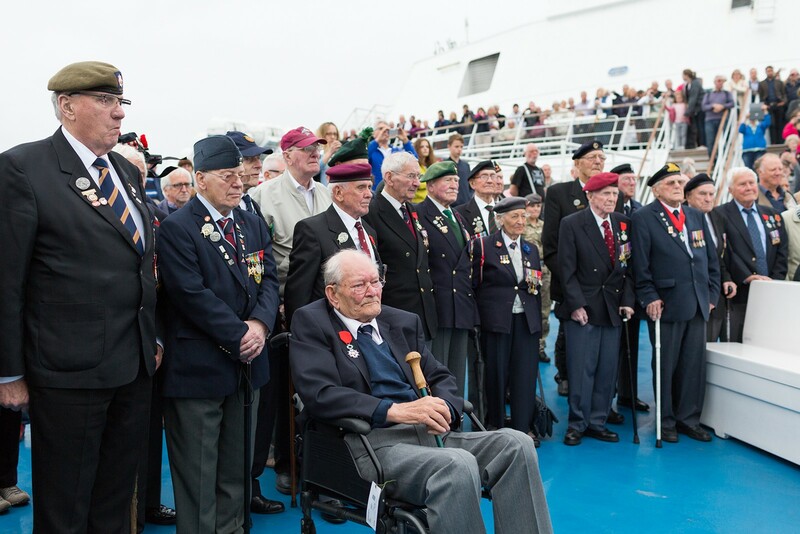 Once in sight of the French coast and with the Captain’s permission, we gathered veterans on the rear deck for a ceremony of remembrance for all those lost at sea during the D-Day assault. The ceremony was watched by scores of the travelling public on board. Royal Navy veteran John Dennett gave the exhortation and the pipers played a lament as a wreath was thrown over the side to land on the slight swell as we approached Ouistreham. Once ashore, it was a short drive to the hotel in Caen. Our first full day in France was busy. It was the 20th anniversary of the unveiling of Montgomery’s statue in Colleville-Montgomery, originally dedicated by HRH Prince Michael of Kent in June 1996. 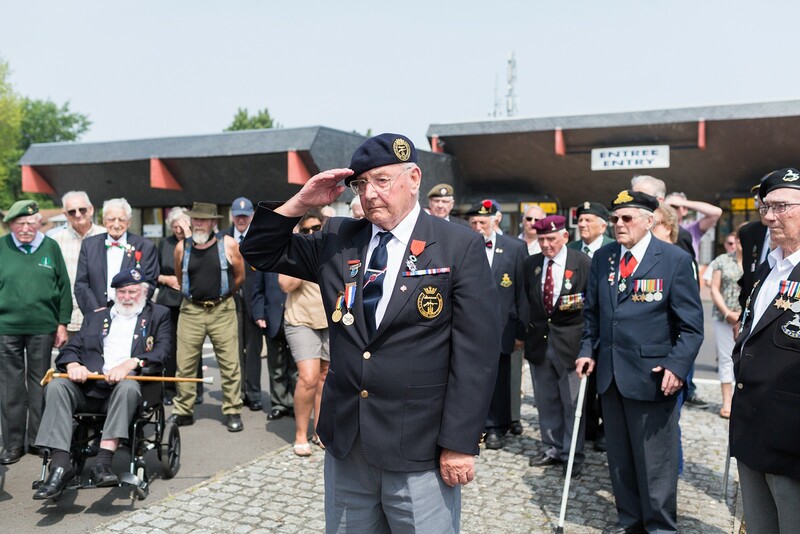 Consequently there was quite a grand ceremony arranged between the former Normandy Veterans Association (NVA) senior representatives and the town authorities. This was very well attended by veterans and locals, with a warm welcome from the Mayor Frédéric Loinard and an address by the special guest, the Hon. Henry Montgomery, who expressed his delight at being invited to represent the family. The ceremony was closed by Emma Brown singing “Amazing Grace” and it was rather moving to hear the veterans quietly joining in with her. 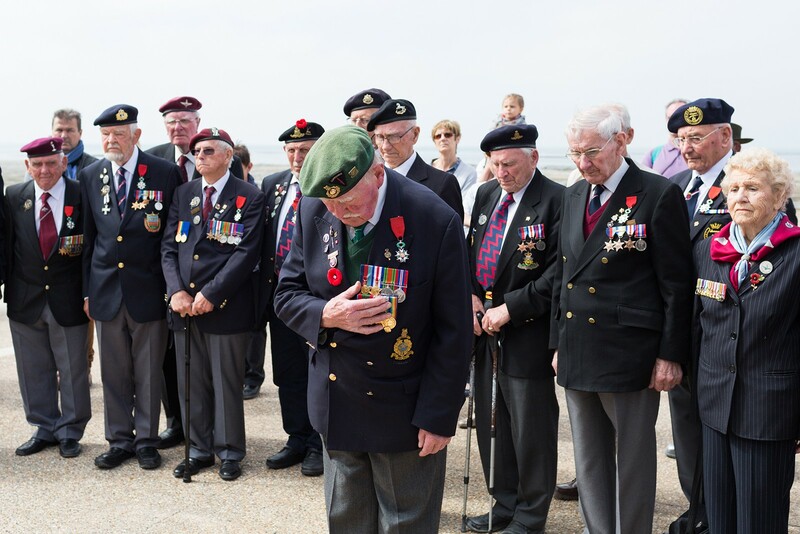 Afterwards those veterans who were able marched the short distance to Sword Beach, where the people of Colleville-Montgomery had prepared a Vin d’Honneur reception. 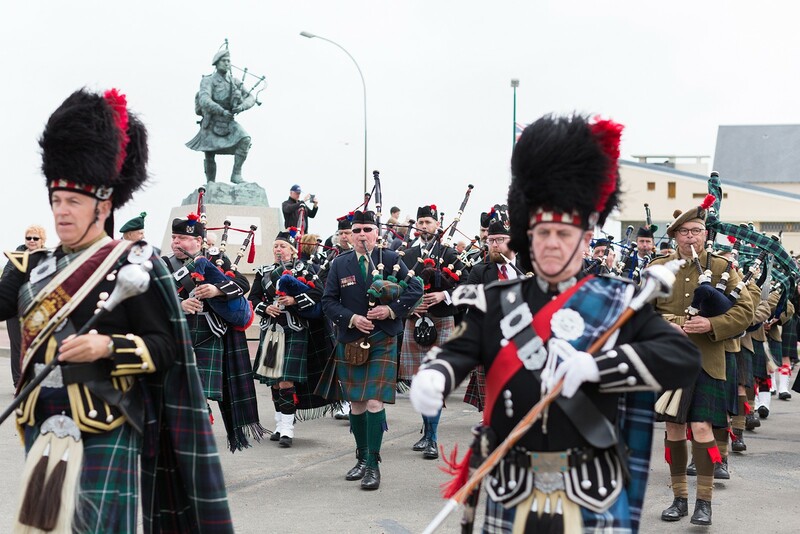 The D-Day Revisited group was led to the statue of Piper Bill Millin by the Jedburgh Pipe Band. 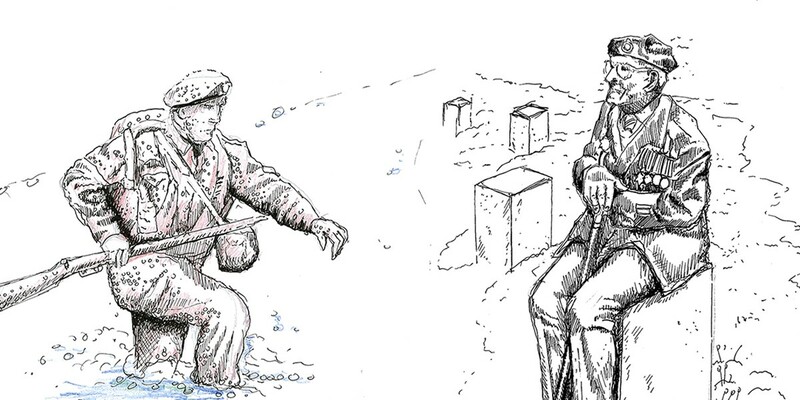 Our own ceremony at the statue has become an annual tradition and was attended by many local people. 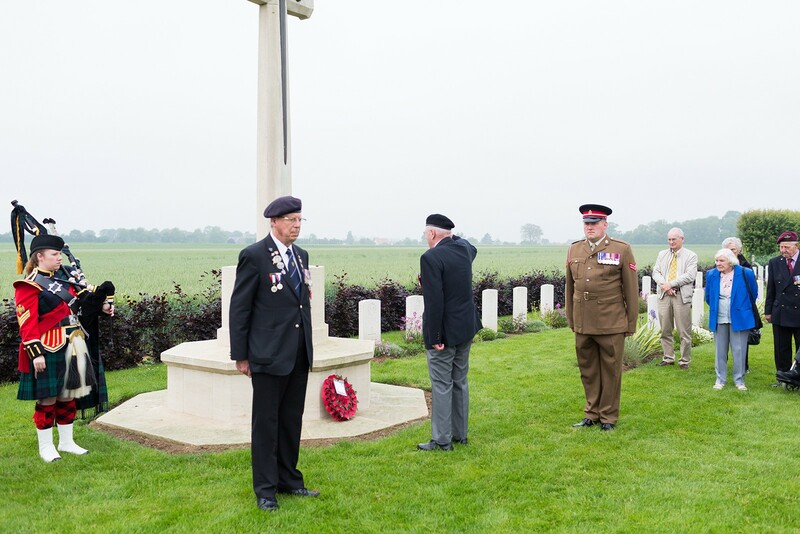 After speeches by John Millin and John Phipps, the Normandy veterans present gave the exhortation and laid their wreaths. 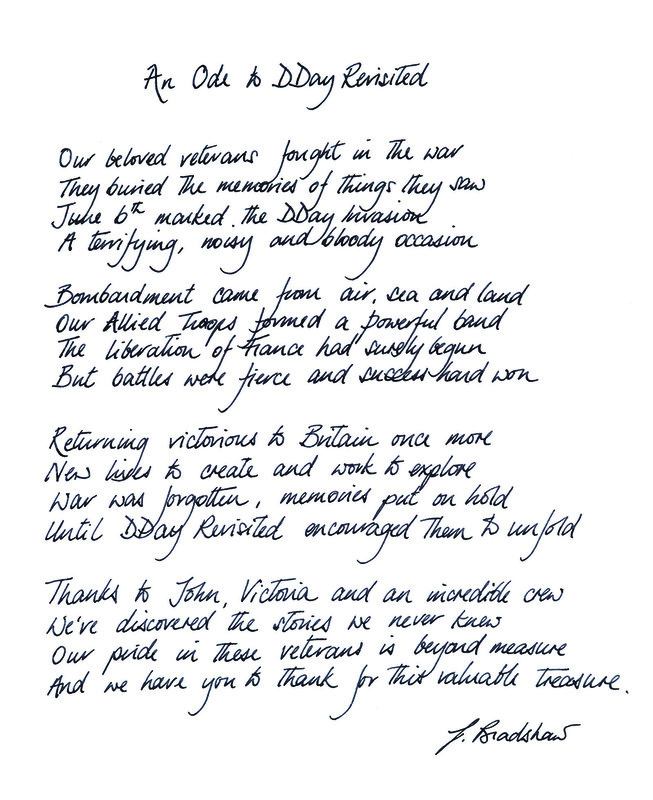 It is always emphasised that the statue is here at the edge of Sword Beach as a permanent symbol of the bond between the veterans and the people of Colleville-Montgomery, with Piper Millin as a symbol of the courage and determination of those who landed here 72 years ago. Whilst the majority were enjoying the Vin d’Honneur, a few of us crept down to the beach to lay a few poppy petals at the water’s edge in memory of John Shanahan. It was a lovely, intimate farewell to a very dear friend who at the age of just 23 stepped onto that very beach on D-Day with a bicycle strapped to his back… ready to take on Jerry! Once everyone was back on board the two coaches we made our way to the Juno Beach Museum, enjoying a pack lunch on the way. A reception had been prepared by the Museum Curator and staff. Marie-Eve Vaillancourt gave a speech of welcome briefly, emphasising the Canadian contribution to the Invasion. John Phipps thanked her and her colleagues for their kind welcome and introduced those veterans in the group who had landed at Juno, including Patrick Churchill and Tony Huntbach. The proceedings were concluded with a wreath laying at the memorial, after which everyone in the party enjoyed a tour of the new museum. 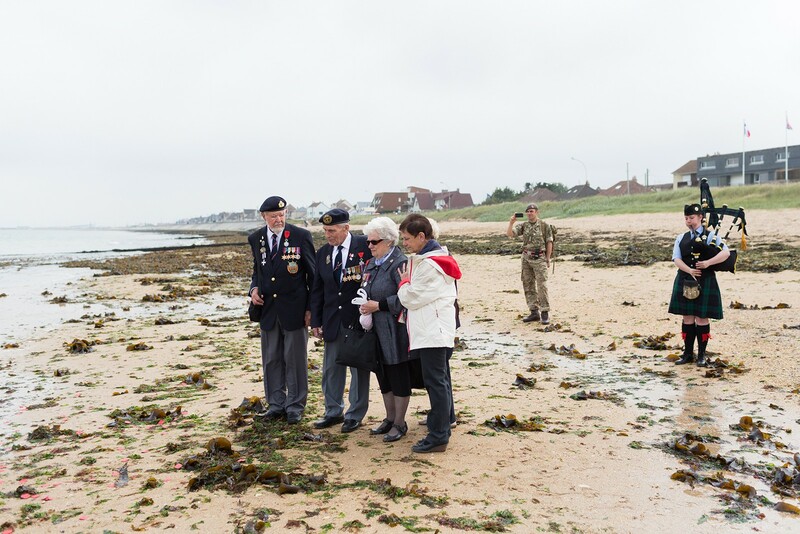 This visit was followed by a short journey to Juno Beach itself where many veterans took the opportunity to walk along the sea front to Canada House, where we planned to pay tribute to another veteran who passed away only weeks earlier, Jim Baker DSM. Jim made a point of visiting Canada House every year. He was always overcome with emotion as he remembered the friends he lost on the perilous approach to Juno Beach on D-Day. Of course when the occupants of Canada House saw our group of British veterans arrive they rushed out of the house to greet everyone. They all remembered Jim very well and were pleased and proud to partake in our brief ceremony in his memory. Fellow Royal Marine veteran Patrick Churchill said a few words and laid a wreath in memory of those young Canadian soldiers Jim often referred to as “his boys”. As time passed it became apparent that the scheduled visit to the Ranville Cemetery would be somewhat rushed, so after consultation with the veterans themselves it was decided that the two coaches would go straight to the restaurant: Bill Millin’s favourite, la Ferme Saint-Hubert. Everyone was pleased to take their seats and enjoy a relaxing glass of local wine. This turned out to be the lull before the storm! What a grand and extraordinary evening this turned out to be! It began quite peacefully with veterans and companions enjoying the quiet rest after a busy day. Then the pipers arrived. Following our arrangement with Luc Monod of ‘Pipers of the World Unite’ all the pipers from the Pegasus Bridge event arrived at the restaurant. 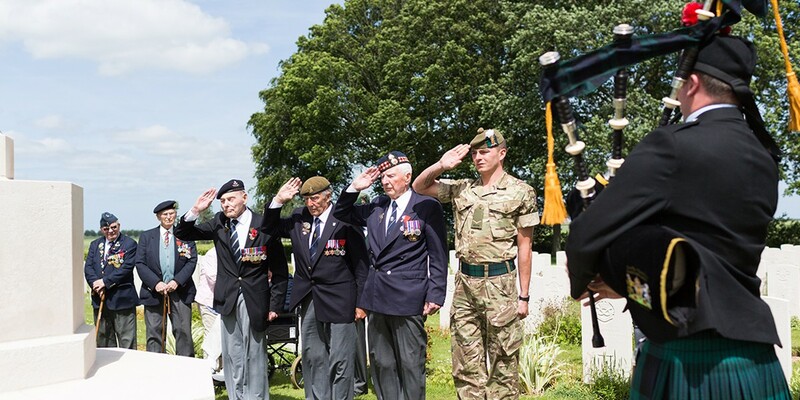 The group included John & Dorrie Millin and family, as well as the members of the Jedburgh Pipe Band who travel to Normandy every year at their own expense to pay tribute to the veterans. The restaurant experience itself exceeded expectations and everyone enjoyed the delicious local food. As the meal came to a conclusion the pipers massed inside the linked rooms and gave their own repertoire in tribute. It was loud! Quite astonishing in terms of a restaurant experience, but full of bonhomie and grand spirit. The evening was particularly memorable for our volunteer Piper, Craig Wright, who celebrated his 20th birthday that day. How often do you get scores of pipers, including Bill Millin’s son and grandson, playing and 45 Normandy veterans singing “Happy Birthday” to you?! It was such a memorable occasion – sufficient for example to tease a wheelchair bound veteran, landing craftsman Bob Reeves, out of his seat to join Piper Robyn in a Highland Jig (you’ll find video evidence of this on our facebook page)! 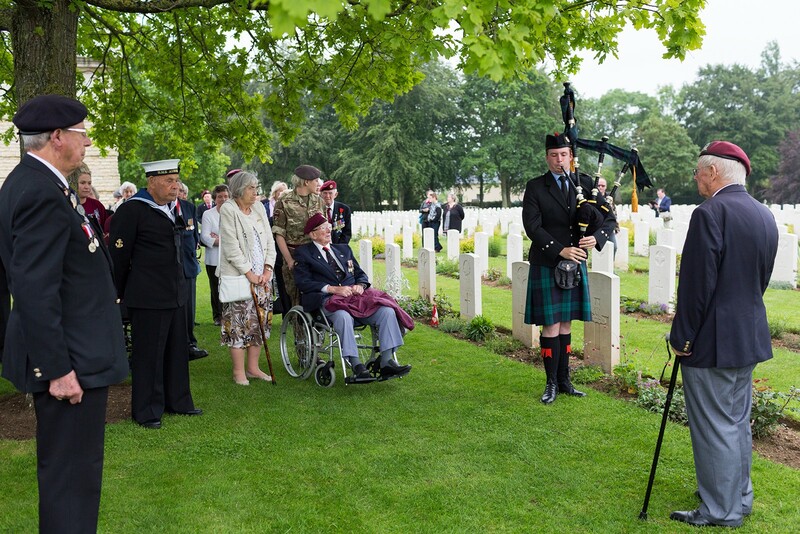 To bring the story together and to thank the Pipers, several veterans were personally introduced to tell their own D-Day story. As the Pipers had just come from Pegasus Bridge. This included: Glenville Jones, who had landed at Ranville sitting in his Jeep inside a Horsa Glider; Len Buckley of the 6th Parachute Regiment, who landed by parachute at Pegasus in the early hours of D-Day; Ivor Anderson who landed near to Pegasus Bridge by parachute; Ray Shuck who remembers seeing Piper Millin and Lord Lovat relieving the Ox & Bucks at Pegasus as they advanced from Sword Beach and Glider Pilot Michael Brown. Although sorry to leave the restaurant, the tired but happy veterans were piped back to the coaches. A special treat was Craig Wright playing the Millin-Montgomery Pipes, offering his own special tribute to the veterans as they bade farewell. Sunday 5th started with the postponed visit to Ranville Cemetery, where the veterans gathered for a wreath laying ceremony at the central memorial. A small group took the opportunity to visit the headstone of Bill Cunningham. He was the Commanding Officer of another good friend, Lance Rooke, formerly of the Royal Ulsters and 9th Paras. Lance would lay a cross for his CO every year and so we wanted to do the same on his behalf. On to Pegasus Bridge. 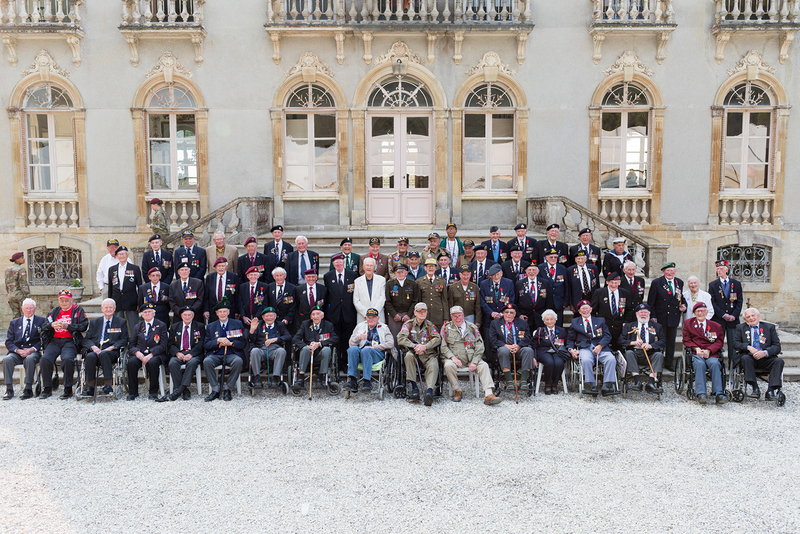 Veterans joined the official Parachute Regiment Association ceremonies at the old bridge in the grounds of Musée Memorial Pegasus, where Ivor Anderson and Ray Shuck were proud to be presented with their Legion d’Honneur medals. Once this ceremony had taken place many took the opportunity to visit HSL 102 and MGB 81, which had been brought over from Portsmouth by the PNBPT. There we met Neil Rankin, Peter Goodship and their team of intrepid sailors. Throughout the morning HSL 102 ran trips along the Orne River for veterans and their companions. This was great fun, with an occasional tincture offered to special guests on board! Many visited the Café Gondrée and generally enjoyed a relaxed morning, mingling with other veterans. A pack lunch was provided during the road journey over to the American Sector. We stopped at the new Overlord Museum which is situated near to the US Cemetery at Colleville-sur-Mer. The group was greeted warmly by the son of the founder. With refreshments laid on for the veterans enjoyment, everyone spent a leisurely couple of hours touring the museum. The group arrived at the Château de Bernaville much later than planned, having been delayed by road blockages set up to manage the parachute drop and main ceremonies at Iron Mike. 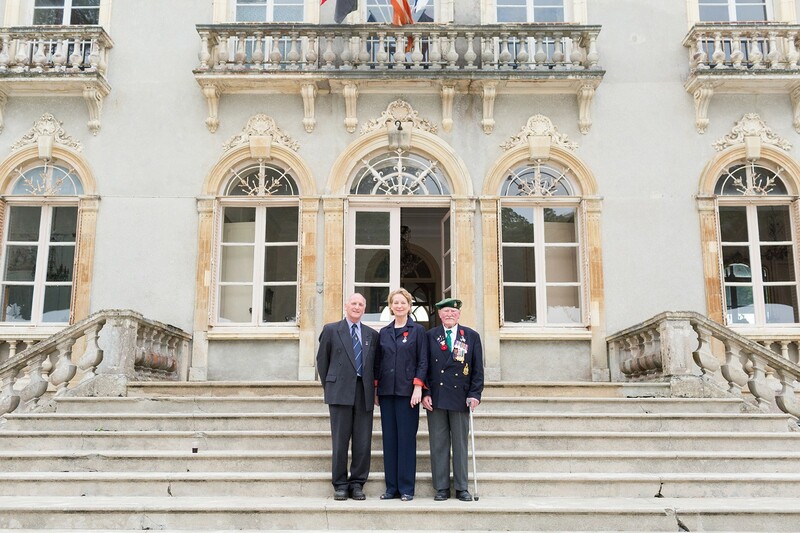 Evenutally we found our way through and were greeted at the Château by Countess Dorothea de la Houssaye and Simon Rock de Bessombes, both leading lights of the Normandy Institute which operates the Château as a developing educational centre for awareness of the D-Day story. Also in attendance was Susan Eisenhower, granddaughter of the General and later President of the United States. As Henry Montgomery was also at the Château at our invitation, there was an obvious photo opportunity to grasp. During the occupation and in the run up to D-Day, this Château had been HQ to Field Marshal Rommel and there is a well known photograph of Rommel on the grand entrance steps. So we quickly gathered together the three key people: Susan Eisenhower, Henry Montgomery and Normandy veteran, Patrick Churchill. So 72 years later, in defiance of Field Marshall Rommel, on his steps we had an Eisenhower, a Churchill and a Montgomery! A barbecue meal was served in a marquee set up alongside the Château. 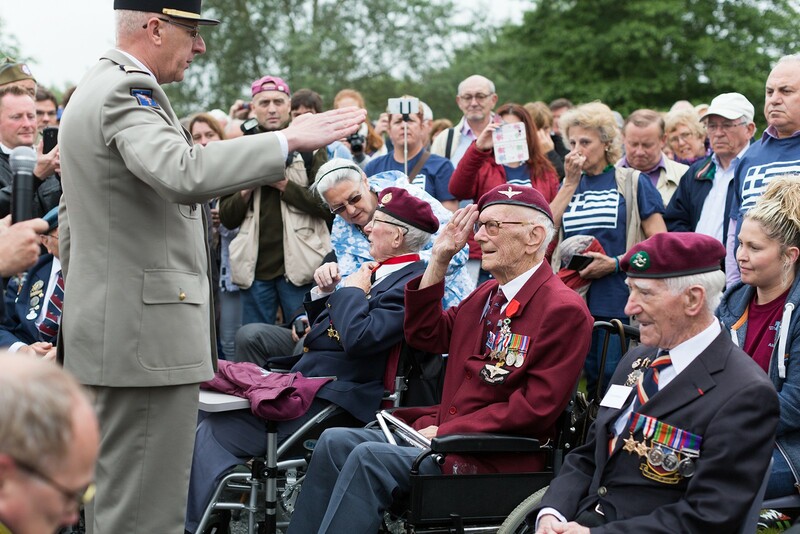 After which, the main ceremony took place to award Légion d’Honneur medals to a small and select group of veterans. All were assembled on a central podium, where Dorothea de la Houssaye made a brief introduction. The veterans in question were US Army Omaha Beach veteran Bert Chandler, Royal Navy Landing Craft veteran Frank Diffell, Royal Navy HMS Rodney veteran Ted Palmer, King’s Regiment Juno Beach veteran Tony Huntbach, Royal Signals veteran Bill Pendell MM and Royal Navy Omaha Beach veteran John Grange. 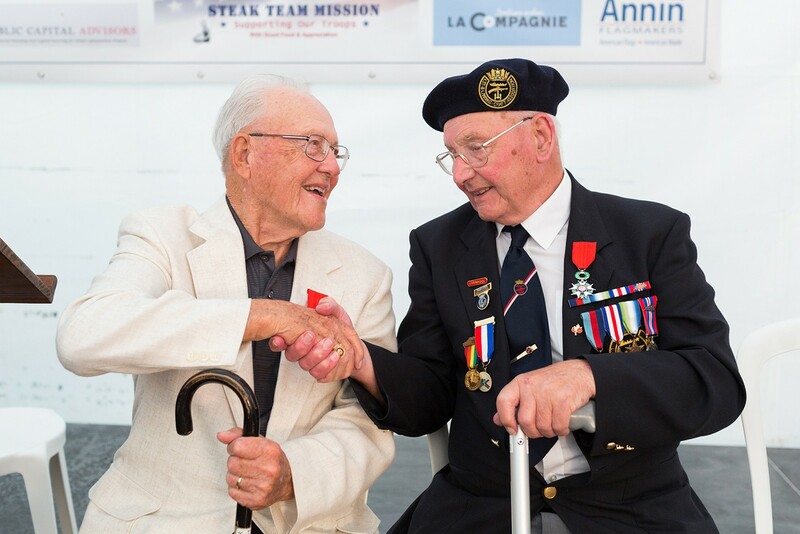 By extraordinary coincidence, as Frank Diffell and Bert Chandler began talking of their D-Day experience they discovered they had both been on the same ship! Frank explained he was on the crew of an assault Landing Craft in the first wave at Omaha Beach and they quickly worked out they could have been side by side 72 years ago at that critical time. RAF veteran Frank Ferguson had been stationed in the grounds around the Château in the first months after the invasion in 1944 with the 2nd Tactical Airforce. 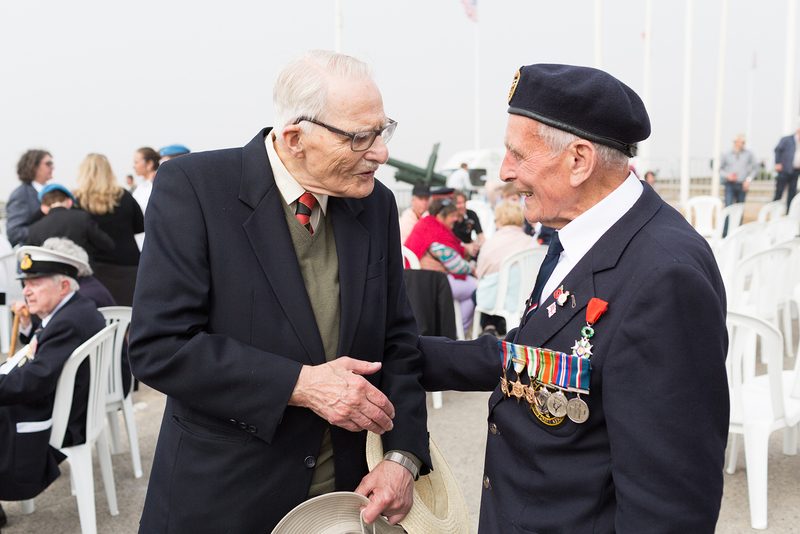 He was invited to say a few words and commented how pleased he was to see the Institution spreading awareness of the D-Day story. He expressed a hope that this would continue for many years to come. ; a sentiment shared by all veterans present, both British and American. Tired after a long day, the coaches departed for the hotel soon after. Monday 6thJune is, of course, the big day for remembrance. This started at 10am with the annual Cathedral Service in Bayeux, primarily arranged by the Royal British Legion. We arranged for one coach to head to Bayeux and the other to visit a cemetery near the village of Secqueville-en-Bessin. We hadn’t visited this cemetery before and everyone who attended was struck by how peaceful it was. This small cemetery, with just 117 graves (including 18 german), is only accessible via a long narrow track between lush green fields. Like all cemeteries in Normandy, it was immaculately cared for and a fitting place to pay quiet tribute and remember all those who lost their lives in fields such as these, fighting for freedom. 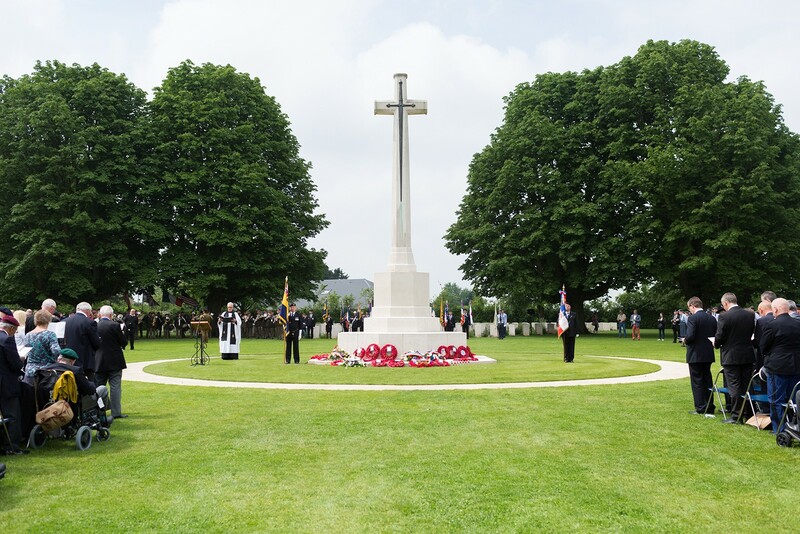 After the Service, everyone joined together for the Royal British Legion’s Service of Remembrance at Bayeux Cemetery. This official commemoration was very well attended as always. From here, a pack lunch was provided on the coaches during the short road journey to Arromanches. As usual, a tourist style afternoon in Arromanches-les-Bains provided a mood change and everyone enjoyed a leisurely stroll around the main street and promenade overlooking Gold Beach and the Mulberry Harbour. 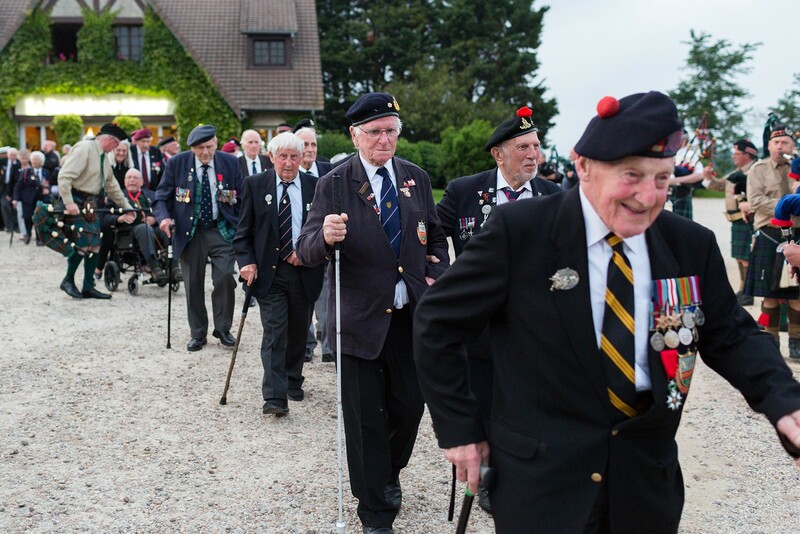 All Normandy veterans were granted vouchers to the value of €100 to spend in the town. This generosity was much appreciated and helped everyone in the group to enjoy the afternoons entertainment. 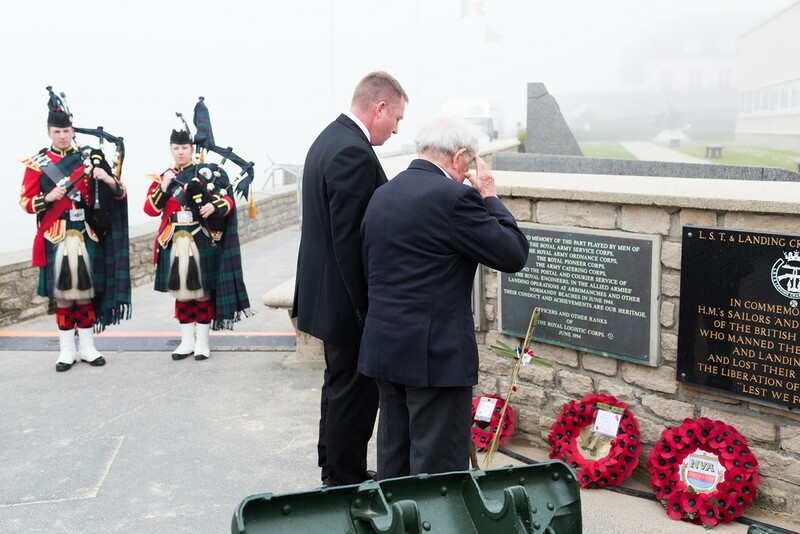 On arrival we set up a wreath laying ceremony at the artillery piece alongside the museum; this is an annual feature of the D-Day Revisited itinerary as tribute is paid to the Landing Craftsmen. We were very pleased to welcome veterans who were travelling in other groups who joined in with this brief ceremony. As usual, the Royal Navy veterans took the lead in the exhortation and wreath laying. The main veterans parade went ahead at 4pm just in time for the cloud to break and the sun to make an appearance. The veterans were led by a Pipe Band and a good number of motorcycles and jeeps of the wartime era. It is always a heart-warming sight to see so many tourists and locals gathered together, cheering and celebrating the veterans! This annual parade is followed by a ceremony in front of the museum, which the veterans all attended. With the assistance of Adrian Cox, we had managed to arrange an evening meal in Arromanches so that the afternoon could be more relaxed, without needing to race back to Caen for dinner. As a party of just under 100, we settled in together the Restaurant 6 Juin. It was a convivial evening, unhurried and a welcome sit down at the end of a long day. Later as we left, the streets were still very busy as everyone enjoyed the evening sunshine. Tuesday 7th was our last full day in France. The morning began with a visit to the small inland town of Thury-Harcourt. 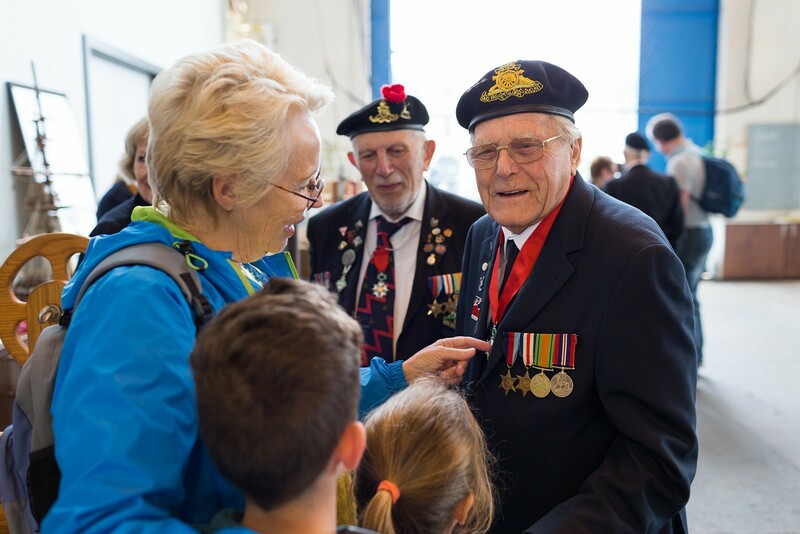 Each year the veterans receive a warm and generous welcome and this 72nd anniversary was certainly no exception. Both coaches arrived at 10am for a wreath laying ceremony at the memorial to the 59th South Staffordshire Division on the approach road to the town. The primary school children joined the ceremony and followed the veterans’ example and paid tribute to the fallen by laying flowers on the memorial. 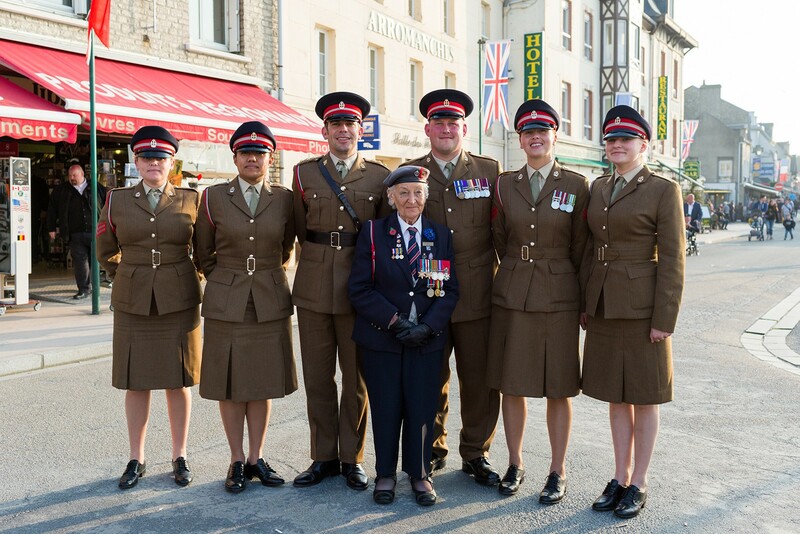 They then accompanied the veterans up to the church in the town centre, where we conducted a ceremony for the civilians of the town who lost their lives during the battle to liberate Thury-Harcourt. Once again, the children had been tutored in the two national anthems – “God Save the Queen” and the “Marseillaise” – which they sang wholeheartedly. 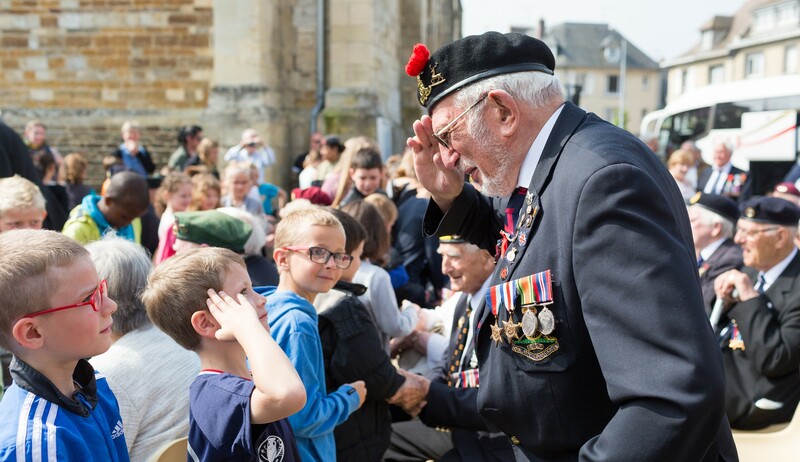 After the ceremony the children walked through the ranks of seated veterans and shook their hands, expressing gratitude for the liberation in 1944. This is always a very moving scene and one which is impossible for British people to imagine without being there. It is estimated that 75% of the town was destroyed in the battle to liberate it in August 1944, including the Château which the Germans burnt to the ground before they retreated. 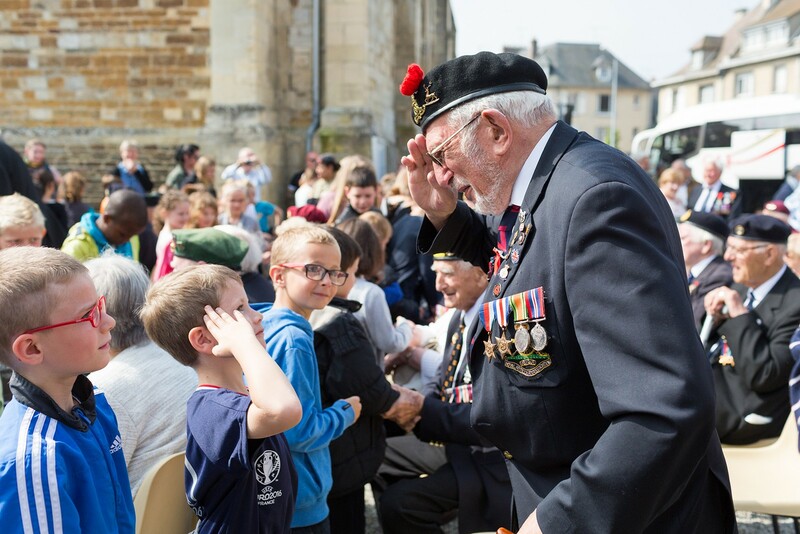 Despite the devastation to this community, they are hugely thankful to our veterans and make great effort to ensure the children of Thury-Harcourt understand the story of D-Day. Everyone was then invited across to the Mairie where the Mayor, Monsieur Paul Chandelier gave a delightful and gracious welcome speech. In response, John Phipps made particular mention of the civilian losses during the violent liberation in August 1944. Expressing the views of all British persons present, John thanked the Mayor for another generous welcome and coupled this with respect for the townspeople, who likely represent the views of most French people of that period. Death and destruction landed with the Allies on D-Day, yet it is gratifying to witness that French citizens accept this as the price of freedom and to know they do not lay blame on the liberators. After an aperitif of local apple ciders, we were all invited to a lunch which had been beautifully laid out in the Salle ‘Ernie Blincoe’, where we were joined by our hosts, M. Chandelier and Micheline of the ‘Societé 59th South Staffordshire Division’. As always, our thanks go to Paul Chandelier and the staff at the Mairie for such a generous tribute. The visit to Thury-Harcourt is always a highlight of our week in Normandy, as it is so wonderful to meet and mix with local people. For the veterans to see new life and a new generation in the schoolchildren, this at least makes some sense of the lives lost. Waving goodbye to Thury-Harcourt, the two coaches then took a couple of hours in a slow tour of the ‘Bocage’ countryside. At one point Royal Artillery veteran, Joe Cattini, came to front of the coach and told the story of his progress through that region over the microphone. This was very interesting and it is worth noting that one of the veterans later commented that Joe’s talk was the highlight of his Normandy visit. Michael Brown, a pilot of the Glider Regiment, explained that his visits to Normandy had exclusively been to the Pegasus and Ranville area, never experiencing the wider picture of D-Day and the ensuing Normandy Campaign. The drive was punctuated by visits to Jerusalem and St. Manvieu Cemeteries, where we held brief wreath laying ceremonies. After another busy day, everyone was pleased to be back at the Caen hotel in good time for a relaxed evening. The meal at the hotel was well received, with many complimenting the quality and service. John Phipps gave a closing speech, mainly to thank all the helpers: the QARANC team, led by Cpt. James Krause; our two intrepid drivers from Carver Coaches; Craig and Robyn for their timely and tuneful piping accompaniment; Eamonn Cowann, Lee Mottrom and Michelle Gillespie for always being on hand to assist with the most trifling concern and finally of course Edwina and David Phipps. 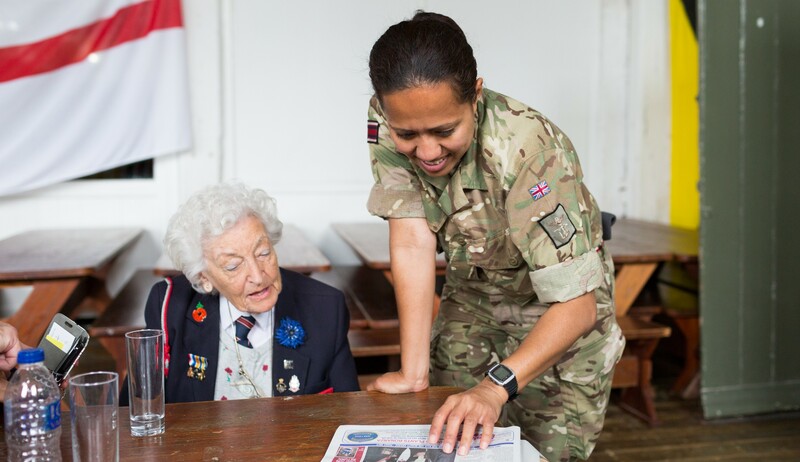 From all the veteran pick-ups and events starting in Southwick House, right through all the ceremonies, meals and gatherings, arrangements are a challenge to bring together with months of planning, so special thanks were also offered to Victoria. After a hearty breakfast the following morning we check out of the hotel and coaches were fully loaded for the journey back to the UK. As quite a few in the party wanted the opportunity to do a bit of souvenir shopping, we visited a nearby shopping mall where everyone was let loose for a couple of hours to please themselves. As we waited to board the 2pm ferry, a group of veterans carried out the final wreath laying ceremony of the trip. This was at the Royal Navy & Royal Marines Memorial situated alongside the Brittany Ferries terminal building. Royal Navy veterans Frank Diffell and Richard Llewellyn led the tribute. Once on the ferry, there was a relaxing six hours before coming into sight of Pompey. Coincidentally John & Dorrie Millin were on board, so there was a good convivial gathering as everyone recalled their highlights of the week. Several veterans were delighted to be invited to visit the bridge on the ferry, which they very much enjoyed! We’d like to thank the Captain and crew for this thoughtful invitation. An early evening arrival into Portsmouth saw a quick passage through UK Immigration and then off to the nearby Holiday Inn Hotel. Checking in 100 people was surprisingly smooth as reception staff were well prepared. After a good night’s rest and breakfast, there were sad goodbyes to those who were making their own way home, before the coaches hit the road north. 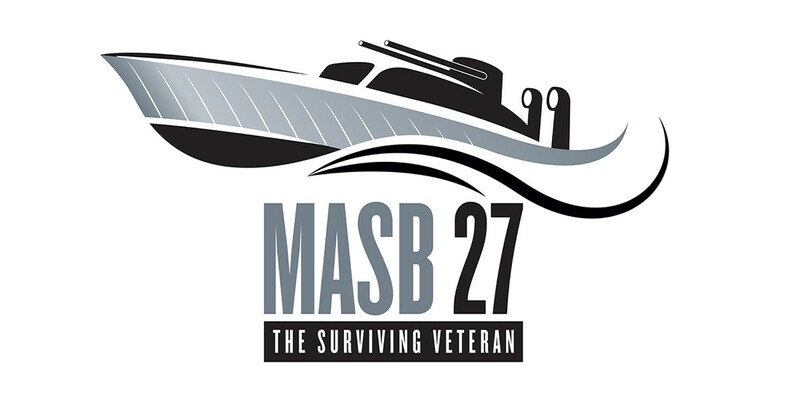 2019 – MASB 27 Coming Soon!